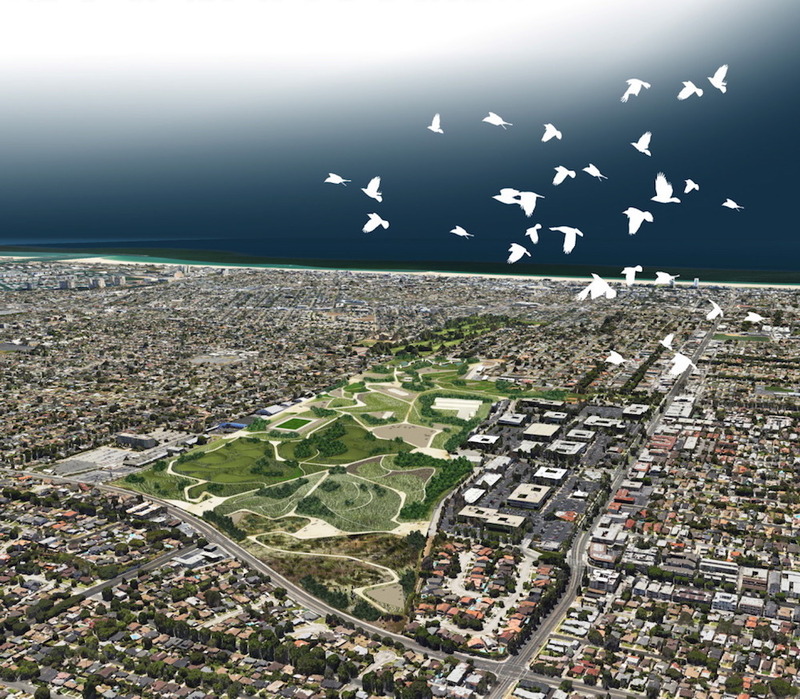 A new 150-plus-acre park on the Westside of Los Angeles might seem like a pipe dream—at approximately $200 a square foot just for the land, that’s almost $1.3 billion. That doesn’t include the spectacular costs of buying out homeowners—assuming there was a government agency with the financial resources and huevos to use eminent domain to do it. But Santa Monica could create such a park. It already has more than 150 acres of contiguous land under public ownership, with no homes on it, and only handful of existing structures. This land is called Santa Monica Airport. Most of the land at the airport has been in aviation use since the late 1920s. But it was originally purchased by Santa Monica residents with a park bond in 1926. Last November by a 60 to 40 percent vote, Santa Monica voters approved a measure to convert the airport into park land—which the Federal Aviation Administration (FAA) opposes. As the city’s legal efforts to close the airport gain momentum, what might happen when the city gains control? One of the densest West Coast cities, Santa Monica today has only 1.47 acres of parkland for every 1,000 residents, compared to Los Angeles (8.5), San Francisco (10.3), Seattle (11.8), Portland (26.2) and San Diego (30.8). Such a park would serve not only Santa Monica but also the region. While our beaches and mountains provide us with incredible open space opportunities on the edges of our urban environment, in the heart of Los Angeles we have only two large regional parks: Griffith Park in Northeast Los Angeles (at 4,210 acres) and Kenneth Hahn State Recreation area in the Baldwin Hills (387 acres). (The L.A. River promises to become a third.) Such opportunities should be seized when they present themselves. Within the last generation, we lost a rare chance when over 300 acres of the Ballona Wetlands were turned into Playa Vista, instead of being restored to natural habitat. Plans call for a good portion of a new Santa Monica Great Park to be dedicated to sports and playing fields for all ages. Multiple trails for walking, hiking, jogging, cycling, and skating will be woven throughout—and spectacular views of the Pacific Ocean, Hollywood Hills, and Santa Monica will become accessible to everyone. Then come the social spaces—community and botanical gardens, picnic areas and children’s playgrounds, artworks, cultural facilities, a municipal pool, and maybe even a farm animal sanctuary. There is also broad support for significant new natural habitat, including native plants and an urban forest or arboretum. With California having lost over 90 percent of its wetlands since the 1780s, a water element could be part of the Pacific Flyway for migratory birds. Addressing climate change and the drought through establishment of a park must be a priority. Planting a new urban forest would help mitigate against rising carbon dioxide levels in the atmosphere. Solar power should be part of its design. And the park should capture and retain rainwater, and perhaps feature a large underground cistern for water storage. If the park’s design responds to various environmental concerns, more regional, state and federal moneys might be available to cover capital costs. At least one new through-street is likely to be part of the park—both to increase access to the park and to ease extreme north/south pressure on nearby streets. Such a street should be like the mellow roads that cross Central Park in New York or Golden Gate Park in San Francisco; there also should be a reliable transit connection to the nearby Expo line. How to fund park operations? Here’s one answer: by leasing several on-site city properties at higher rates. North of the runway, buildings that have been used for aircraft operations at well-below market rents for years could house tech incubators, with higher rents supporting the park. South of the runway, the goal should be not to raise rents, but to retain and enhance the arts, culture, and education community there. This area already has arts studios, a museum, a theatre, and the Santa Monica College Arts Building, as well as the iconic Barker Hangar events space. Five additional aviation-related buildings there could be converted into arts and cultural facilities. Rarely do we get such an opportunity to meet so many public policy needs and goals at once. But that’s what happens when over 150 acres of public land turn from serving a small number of people to providing for the millions that will use the Great Park over time. How fast could this happen? On July 1, 2015, the City of Santa Monica’s 1984 agreement with the FAA to operate the airport expired, as did all leases to aviation tenants. Soon, the airport may have a much shorter runway and no aviation services. It then may be possible to close the entire airport and convert the whole runway and adjacent areas into parkland. What has been a weak link in our natural environment could become a strength. Instead of air pollution and contamination from private jets, we’ll have new lungs on the Westside. As we plant new trees and other vegetation, we un-pave the Earth so it can breathe. Michael Feinstein is a former Santa Monica mayor and city councilmember and a current spokesperson for the Green Party of California. He is a member of the Airport2Park group and can be found on Twitter @mikefeinstein. *Lead photo courtesy of Chen Liu, Airport2park. Interior photo courtesy of Mike Feinstein.